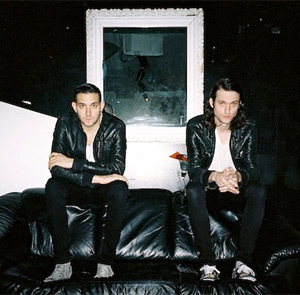 Brooklyn-based duo Holy Ghost! are excited to unveil the track listing and album art for Dynamics, set for release on October 7th on DFA Records. Dynamics is the follow-up to the group's critically acclaimed self-titled debut album, which was released in 2011 and was hailed as a "classic pop album" by The Los Angeles Times. It represents a dramatic expansion of the propulsive Holy Ghost! sound, honed through years of superlative releases, such as the duo's excellent 2009 track "I Will Come Back," their critically lauded 2010 EP Static on the Wire and their 2011 self-titled full-length debut, or the remixes they've done for a seemingly endless list of esteemed artists - MGMT, Cut Copy, Moby, Phoenix and LCD Soundsystem among them. Though they are only on their second album, the experience they brought with them to the studio was a huge advantage. With the recording studio now tamed, the band felt they had more control and better instincts with writing their music. During recording for Dynamics, Alex felt more comfortable with his singing abilities than the first time around, and the duo pushed themselves to record more single-track vocals, yielding a more personal, emotional response. The effect of these things upon the overall recording sessions for Dynamics is that the band are painting in bolder strokes, truly utilizing one of the most important aspects of music (dynamics) to open their songs up to entire new palates of color. "Dynamics is really a descriptive term we used to focus on contrast, but it's also referring to a lot of Alex's lyrics this time around, which deal with the dynamics of relationships," reflects Nick. "It's a good single-word descriptor of what we were trying to do with these songs, something we kept coming back to when writing and recording." At the end of the day, Holy Ghost! are making great dance music that is beyond passing trends, that gets to the very heart of why we love music, that touches our most simple, direct, inborn reactions to sound. "I'm trying to make music that makes me as unabashedly giddy as music made me when I was a kid," says Nick. "I think that's a big part of why we're so obsessed with sounds. Because I think more abstract things, like sound, take [you] places. It's a guttural, sort of ambiguous familiarity to things you grew up with that I think, when you get older, you come back to. And you're like, "Oh - this really is the best".